Autonomous trucking is an area where a growing number of companies are competing for talent and funding, but newcomer Embark is on a bit of a hot streak when it comes to funding, talent acquisition, product development and more. Founded in 2016 by CEO Alex Rodrigues and CTO Brandon Moak, the startup is still very young. Rodrigues and Moak have been working on autonomous driving technology for a long time, however – they worked on self-driving while at school together at the University of Waterloo, where both completed Mechatronics engineering degrees. A roadside accident was what prompted their focus on trucking specifically, however. Embark has since raised $17.22 million across three rounds of funding, from investors including Data Collective (its largest investor), SV Angel, Y Combinator and Maven Ventures. 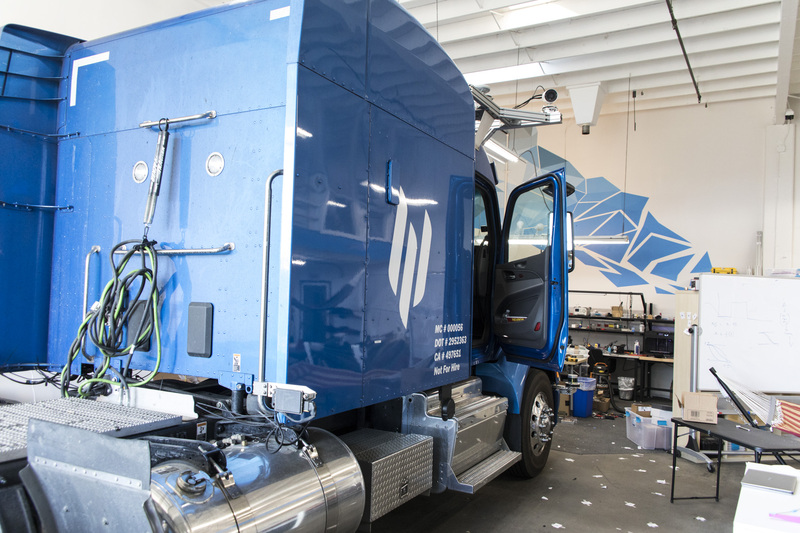 The team is growing quickly, with plans to ramp up from just 17 to 60 employees soon, and the autonomous trucking startup is also in the process of renovating its new space, a large warehouse that once held San Francisco Giants merchandise, but that will now play host to a fleet of up to five or six development trucks equipped with Embark’s self-driving technology. Rodrigues walked me through the new 15,000 square-foot space, which is not quite finished but is taking shape, with a move-in date hopefully set for October. 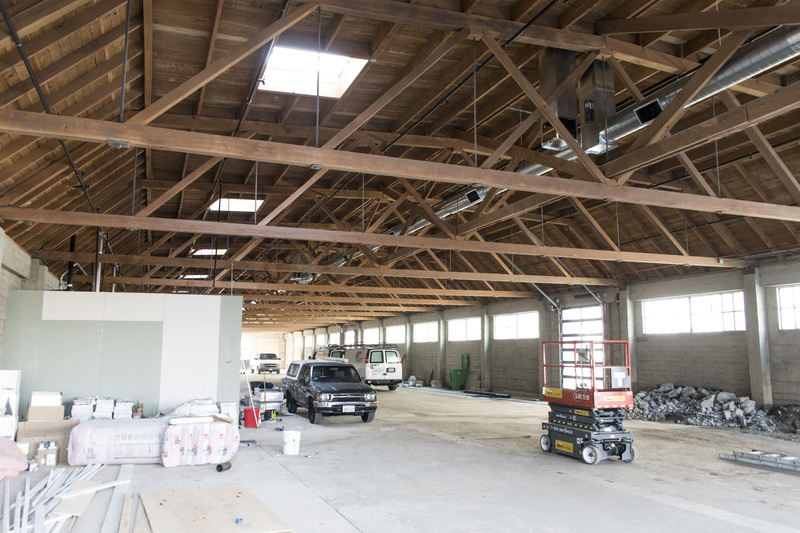 It’s mostly open floor with high ceilings, along with a loading ramp in the back for trucks to drive in and out. There will be a few break-out meeting and telephone rooms, but mostly it’s going to remain open concept. I also visited Embark’s current HQ, which is down the road further into Silicon Valley at Belmont. It’s a much more cramped affair, with room for just one of its Peterbilt semi trucks, without a trailer. They do have their second, newer truck in the space next door, which they rented from their neighbor and connected by literally cutting a crude hole through the separating drywall. Besides the space for the trucks, which take up a lot of room, there’s not a whole lot more that makes up the current Embark space. A table and lunch room occupy the rest of the garage floor, and there are two offices on a second floor for engineers. A backyard provides access to a shared BBQ and trampoline. Embark’s done a lot with a little in its short existence, however; today, the team released the video above, which speeds up two hours of continuous, autonomous highway driving without a single manual takeover. It’s a new record for the company, and features not only autonomous driving in a single lane, but lane changes, freeway transfers and more, with speeds of up to 55 MPH (the legal limit, of course). I took a ride in Embark’s first Peterbilt truck, which was loaded up with a suite of sensors, including Velodyne LiDAR, optical camera and radar arrays. Inside the cab, there’s not much that would clue you in to the fact that the truck has autonomous capabilities. There are still pedals and a steering wheel, of course, and the sleeper bed in the back is still there, too. Underneath the bed, however, there’s a whole lot of computing power – a series of Nvidia GPUs and other components that are the brain of the self-driving truck. Embark does all of its processing on the truck itself, including sensor fusion and route mapping. An engineer can sit in the back and monitor the live data coming in in real-time, while the safety driver keeps his hands on the wheel ready to take over if necessary. The safety driver also manually drives the truck onto and off of the freeway (the driver’s hands have to be on the wheel at all times since Embark’s technology qualifies as SAE Level 2 autonomy in the eyes of the California Department of Motor Vehicles). For Embark, a continuous autonomous drive of 100 miles is a big milestone, especially with the complexity of the drive that also includes, for the first time on camera, a self-driving truck handling multiple lane changes, highway transfers and navigating lanes that don’t have clearly defined markers. To get to market, Embark will need to rack up a lot more miles, and Rodrigues says they learn a huge amount and make a lot of changes every time they complete a new test run. Embark’s focus is dedicated to highway driving right now, which is something it hopes will help it move faster than the competition. The major challenge to address in the trucking industry is the lack of available talent in the long-haul space specifically. Rodrigues told me that there’s no shortage of jobs, but younger generations don’t want to deal with the long hours and ample time spent away from home and family that comes along with long-haul jobs. Embark hopes to address this by making the long stretches of highway driving completely automated, and using short-haul drivers at both the beginning and the end of the journey. Short-haul drivers are much easier to find, since they requirements don’t involve spending weeks on the road and prolonged hours spent in a truck cab. “By doing that, you’re able to create more of the high-paying local jobs that the younger generation actually wants,” Rodrigues noted. Rodrigues told me that he hopes its tech can be put to commercial use by the beginning of the next decade. He’s not talking any specific timelines or dates, however, and is cautious of anyone who is doing so at this early stage in terms of the tech’s development. Embark’s newest truck, another Peterbilt that the truck maker actually customized for the startup’s use, shows some of the promise of what it hopes to achieve in the future: Embark convinced Peterbilt to build in fuel tanks capable of holding 48 hours’ worth of gas on board, which means the truck could conceivably drive for two days straight – enough to theoretically cross the U.S., or at least come close.